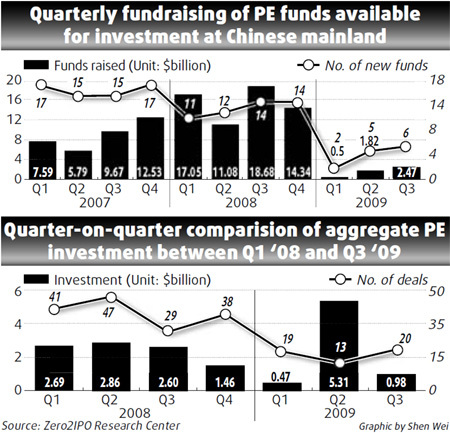 China's private equity (PE) fundraising and investments rebounded in the third quarter, with renminbi funds leading the trend, according to a new report from Zero2IPO, a Beijing-based company specializing in venture capital and PE research, consultation and investment. According to the company's "Chinese PE Report Q3 2009", six PE funds available for investment in Asia collected $2.47 billion. Meanwhile, the third quarter witnessed 20 enterprises on the Chinese mainland garner PE investments, among which 16 disclosed a total investment of $982.92 million. In terms of exits, seven deals took place in the third quarter, among which four ended up with the listing of investors. 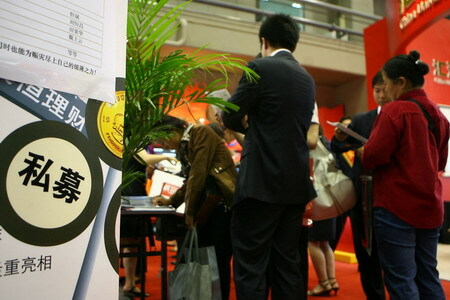 The amount of newly raised funds is on the increase with renminbi funds taking the lead, according to the report. The research results from Zero2IPO Research Center showed that newly raised PE funds targeting the Asian market rose continuously in the third quarter. During the period, there were six PE funds available for investment on the Chinese mainland fulfilling fundraising for $2.47 billion -- significantly down by 86.8 percent year-on-year. In this case, although the gross amount of newly raised funds slightly increased quarter-on-quarter, the funds still faced difficulties. This also clearly mirrored the changes in the PE upstream supply chain. First, the booming PE market became a magnet for investors, while general partner-invested enterprises showed vulnerability after the outbreak of the global financial crisis. Second, the funds raised in 2008 failed to fully make investments, due to an industry recession and general partner investment slowdown. In the third quarter, five growth funds completed fundraising for $270.86 million, accounting for 83.3 percent of the total amount of funds. The number of growth funds in the third quarter increased compared with that in the second quarter, while the amount raised dropped a dramatic 84.5 percent. There was another buyout fund worth $2.2 billion completed in the quarter, constituting 89 percent of the total fundraising amount in the third quarter. In terms of currency, all of the six PE funds targeting the Asian market, including China, were renminbi funds for the first time, which further supports the research results of Zero2IPO Research Center on the development trend of renminbi PE funds in recent years. Along with the funding injected into China's multi-layer capital market, renminbi funds on the Chinese PE market are apparently ready to become more developed. China's Social Security Fund had called for enlarging its investment in PE funds, and the China Securities Regulatory Commission lowered the access threshold for stockbrokers' direct investment in the second quarter. Then local governments, headed by Shanghai and Beijing municipal governments, constantly created new policies and gradually removed the policy barriers in the foundation of renminbi funds in China. This, in turn, incurred another round of upsurges in the fundraising of renminbi funds. Moreover, there were no US dollar funds raised in the third quarter, because more general partners delayed fundraising and more funds were discarded due to the persistent depression of the global economy.